Living on a sailboat while still practicing medicine didn’t seem like a realistic goal, but then Dr. Robin Mangione was introduced to locum tenens. It not only made practicing medicine while sailing a possibility, but it suited it perfectly. To date, Dr. Mangione and her husband have sailed over 5,000 miles, primarily on the Eastern seaboard, but they soon hope to upgrade their boat and eventually travel the world. Dr. Mangione and her husband began sailing in 1999, and what started as a “cool way to spend time together and travel,” evolved into a full-blown romance with the sailing life. “My husband read Maiden Voyage by Tania Aebi who, between the ages of 19 – 21, completed a solo circumnavigation of the globe, and after reading it he fell in love with the idea of sailing. So we bought a sailboat and taught ourselves to sail,” she shares. “So far we’ve been down to the [Florida] Keys, and up the Eastern seaboard,” she says. They decided to test drive this living arrangement for a year, to see if it was financially or personally feasible. Living on a sailboat can be a test of anyone’s relationship, as you are always within 30 feet of your partner at all times, but Dr. Mangione says they enjoy each other’s company and wouldn’t have it any other way. Because of their mobility, they’ve been able to see parts of the world that just wouldn’t have been possible if they lived permanently in their home in Arkansas. The amount of locum tenens assignments has made seeing the different parts of the country a lot easier, and Dr. Mangione is able to pick and choose where and how long her assignment will be; she also uses this autonomy to decide how long between assignments she’d like to take off. They feel that assignments of three to four months is the perfect amount of time for exploration, but Dr. Mangione says she also likes to choose assignments of a week or weekend, since right now she’s decided not to work full time. 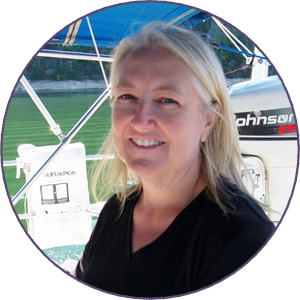 Dr. Mangione says that without the flexibility of locum tenens, she and her husband wouldn’t be able to fully appreciate the area and culture of each assignment’s location – or follow their dream of nautical living.